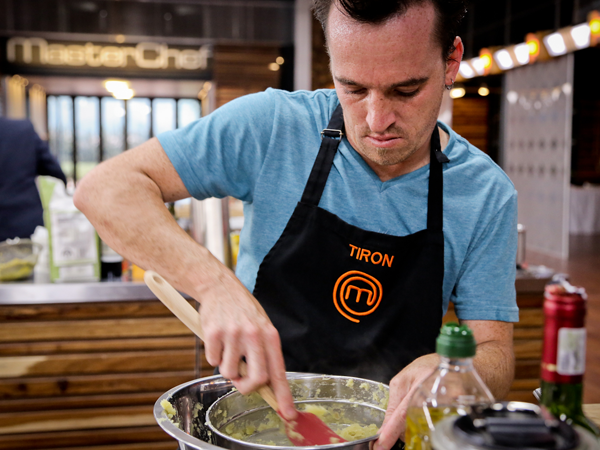 Thirty-two-year-old former video store clerk Tiron Eloff made his last meal in the MasterChef South Africa kitchen last night. And it was a dish to be proud of. His pan-seared medallion of venison with a biltong-and-rosemary crust, rooibos-infused sweet potato, buttered asparagus and a mebos red wine jus, was loved by the judges. But his lack of plating skills and an under-reduced red wine sauce saw him having to hang up his apron. We gave him a call to see what he’s up to these days. Hey, Tiron. Top 6, not too shabby . . . It is a great achievement. I was thinking that if I made the top 50, I’d be happy. So it really is fantastic. Why did you decide to enter MasterChef? I love the show and I love cooking. It’s a good way to get into the industry. I entered the first season, but only passed the cold audition. I decided to give it one more shot. If you fall down, you have to get up again. I really pushed myself and was surprised by the outcome. You were a video store clerk . . . and things weren’t always easy? No, they weren’t. I helped run the video store, and the industry is going down. I needed to make a career-path change. The shop was busy closing down and it just gave me another reason to enter MasterChef. There are a few! Shawshank Redemption, Armageddon and Braveheart. Do you have any childhood memories of cooking? I remember waking up at 5 am on Sunday mornings to do newspaper deliveries when I was 13. My dad had to wake up with me to drop me off. When we’d come back home I’d cook us an English breakfast. How long have you had an earring in your ear for? Since I was 14. Back then it was cool for guys to have an earring. I went through that whole rebellious thing as a kid. The earring stayed. How has MasterChef changed your life? Well, it’s still sinking in at the moment. People are phoning me now that I was eliminated on television. They want to invest in me. It’s changed my life and it gave me a new outlook. It’s been fantastic. What was the highlight of the competition? When I had to cook off against chef Jackie Cameron. She’s someone in the industry and I’m aspiring to be in the industry too. She’s such a great person and a great chef. Chef Andrea Burgener from The Leopard in Melville loved one of your dishes, and was possibly going to make it in her restaurant? I went to eat there six week ago and she possibly wants to put it on her menu in September. I never thought one of my dishes would be good enough and I am humbled and honoured. What have you done since MasterChef wrapped up filming? After I got back, I needed a month and half to get my head straight again. The video store thing was a big mess, and I needed to decide which avenue I wanted to pursue. I’ve done a few private cooking and catering functions. There’s a possibility of opening my own restaurant in October in Randburg, in the same centre where the video shop was! It’s very exciting. My dreams are huge! It starts with the restaurant, where people can get affordable, tasty, good food. I’d like to get celebrity chefs in. I’m also thinking of a guy’s type of cooking show. I’d love to go as far as I possibly can go with this. I also want to tour Europe and spend months in Italy, as northern Italian cuisine is my favourite. But for that I’d need to win the Lotto. It’s also on my to-do list to get married and have kids. I’ve never had the means to take care of a family and I still haven’t met the right person yet. But being single is also fun. 5 ingredients you love to cook with? What are the 4 coolest food words you like? 3 top tips in the kitchen? 2. Keep it simple. Don’t overdo things to impress people. 3. Don’t be scared of research; read columns, watch TV shows, Google stuff. Change your food up and make it interesting. 1 thing you’ve never made but would love to make? Maybe baked Alaska. I’ve seen how they put ice cream in the oven, so I want to do that. I am in a good space, so watch this space!